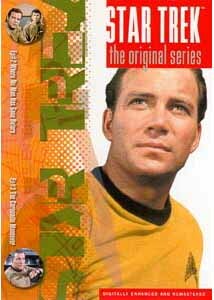 Preface:I grew up on Star Trek: The Original Series, although having been born in 1964 I'm not entirely sure if I truly remember the first run or hearken back to reruns in later years. Either way, as a youngster Star Trek affected me much like many of my generation. As I grew older, and I suppose more cynical, the original series seemed hokey and awkward. But that is the beauty of this series. Its simplicity in character and morality, its honest plea for togetherness and peace, and its promise of hope for the human race is at its very essence a positive, nurturing force. You must remember that during Star Trek's original run that time appeared to be imploding inward, the country pregnant in the turmoil of the post-Kennedy assassination 60's, where hope seemed strange and almost cruel. Star Trek was something you could hang your hat on; a vision of the future that spelled relief from the astonishing television images bombarding living rooms first frequently then every night, shocking a nation into the cold, hard reality of life, hate, war. I am not a Trekkie per se, but instead come at this series from a refreshed point of view, and with the hope that my 13-year-old stepdaughter will find the power within this series. I also hope that I can do this series justice with my reviews (albeit with my particular brand of irreverence), to pay it back for the many years it helped me dream. "Do you like what you see? Absolute power corrupting absolutely. Gods need compassion." In episode no. 2, the crew of the U.S.S. Enterprise follow the distress signal of a ship two centuries disappeared, the U.S.S. Valiant. After beaming onto the Enterprise the Valiant's flight recorder, it is learned, much to the crew's collective shock, that 200 years earlier the Valiant's captain had ordered the destruction of his own vessel. Why? As the Enterprise nears the end of the galaxy, it comes upon a force field, where upon the newly boarded psychiatrist, Dr. Dehner (Sally Kirkland) and Lt. Gary Mitchell (Gary Lockwood), Kirk's best from their Academy days are zapped. Unlike Dehner, who is unaffected, with each passing hour Mitchell becomes more alien, becoming able to consume volumes of knowledge at an ever-alarming pace. Not only does he assume great knowledge, but also telepathic and telekinetic powers as well. Soon he is more alien than human, and filled with hubris, feels himself a god above the tedious humans, becoming a threat to the safety of the crew. Kirk must choose between his friend and the Enterprise, much as the Valiant's captain did 200 years prior. Our first lessons include selflessness, and the need for compassion, particularly from those with power. Random Notes and Amusements: On the lighter side, there are several good one liners and amusing repartee between surviving and departing members of the crew, including wonderful insights into Spock's nature... I did find it amusing that Spock thinks "irritating" to be an Earth emotion, but nothing of the pride he swells with while preening like a peacock trash talking Kirk during a chess game...Let's just say that "surprise" is an Earth emotion Spock experiences soon after...And, by the way, for those ready to flame me, the opening quotes being attributed to James R. Kirk is an allusion to the spelling on Kirk's tombstone in this episode, which was either accidental or forgotten when later changed to James T. Kirk. "What's the mission of this vessel, Doctor? To seek out and contact alien life. We have an opportunity to demonstrate what our high sounding words mean. Any questions?" In episode #3, the crew of the starship Enterprise encounters an alien cube-shaped object blocking its path, causing Spock to call a red alert. All attempts to maneuver away from the object prove futile, and when the cube emits radiation threatening the Enterprise, Kirk determines he has no other option but to order the object destroyed. At this point, Balok (Clint Howard), commander of the flagship Fesarius of the First Federation, announces that the cube is in fact a buoy, which tests the intentions of those whose way it blocks. Since Kirk's decision is to destroy the cube, he and his crew are deemed hostile and are therefore condemned to death. Kirk pleads his case with Balok, but to no avail. It is only the most elemental of poker maneuvers, the bluff, which Kirk resorts to in order to save the Enterprise. When Balok pulls the Enterprise via tractor beam, Kirk pulls away and a distress signal from the I.S.S. Fesarius leads to a startling discovery. Our lesson tonight deals with quickly or pre-formed biases, and how this may lead us to make rash decisions, decisions we may later regret. In other words, don't judge an alien by its cover , because everything is not as it always seems. Right, Dorothy? Random Notes and Amusements: This marks the first episode for Bones, Uhura, and Yeoman Janice Rand, although much like Spock's presence in previous episodes, they appear to be long members of the crew and no back story is given...It is hard to ignore the striking sixties' nature of the sets, costumes, and technology, but Star Trek was one of, if not the first shows, to collect a cast as diverse as this one...Note that the conference room is entirely different and more 60' style futuristic looking than in episode #2...You think Clint Howard is strange looking now...Spock rips off a pretty funny joke in this one...Check out Sulu's reactions to Mr. Bailey's failings...It is obvious too that the producers wished to draw in a strong female audience, as Kirk's hairless bare chest is shown in the Chicago voting fashion, early and often. Image Transfer Review: Paramount delivers a non-anamorphic 1.33:1 original television aspect ratio presentation. All one has to do is watch the original preview trailer included on the disc (do so afterwards if you don't remember the plot or have never seen this episode before) to realize what a beautiful job of restoring and remastering Paramount has done, providing Trekkies with a rich and vibrantly colored rendering, with natural skin tones, and high contrast indoor scenes. Gone is most of the dirt and scratches you can see detract from the preview, although the picture is slightly grainy, but consider the age of the source material. The only real glitch I could find was a bit of jumpiness isolated to one scene in episode #3. Audio Transfer Review: There has also been some debate on the web by purists objecting to the remastered Dolby Digital 5.1 track, and although I understand their point, in my opinion, the new track, although only slightly, enhances the original soundtrack. Perhaps Paramount will consider including a mono track for the hard-liners as well? The 5.1 soundtrack is mostly center channel based, with occasional sweeping effects as the enterprise flies by, and mostly pleasant surround when the incidental music fills out the speakers, the only complaint, and a small one at that given the age of the track, that at times the musical score is not without its peaks of teeth clenching tinnyness. The sound for the rest of the track is suprisingly clean and well rendered, with the dialogue easily understood even if the mix is a bit low at times requiring one to turn the stereo up a few notches more than usual. Extras Review: The disc is not feature rich, containing scene selection, preview trailer, liner notes, and English subtitles and captioning for the hearing impaired, for which I remember seeing a post or letter from a hearing impaired man thanking Paramount for enabling him to watch the series for the first time. A quick note on the subtitling. I did notice that the subtitling is not 100% accurate. On several occasions words were left off of the subtitles, but this had little effect on the overall understanding of the conversations taking place. Although I understand there to be interviews shown on the Sci-Fi Channel during the current syndication run, I am not sure if Paramount ran into issues obtaining rights to these or with trying to get interviews (for the millionth time, I'm sure) with the cast members, either of which could have only added value to this disc. I heard that Paramount intends on producing their own extra features. Perhaps they have some surprises up their sleeve? Stay tuned. All I can tell you is this: I would have liked for there to have been more features, and as I said perhaps there will be special editions or a Season One extra features disc in the future? One can only hope. Regardless though, I am personally very pleased with the attention Paramount has shown first and foremost with the overall remastered picture and sound quality of these shows. If you're a Trekkie, well it goes without saying you MUST own this disc. If your Joe Average Fan, well all I can say is it's like seeing these episodes for the first time. Again. Viva Paramount, and viva DVD!